Paterson, Dec. 25 (Special).—More than three hundred newsboys partook of a Christmas dinner provided by I. A. Hall, Commissioner of Public Parks, this afternoon. Illness prevented his attendance to-day, but he sent greeting to the boys through the Rev. Dr. Stuart Hamilton, rector of St. Paul’s Episcopal Church. Each boy received a card, which, when presented at a local bank, will be good for a bankbook containing the record of a deposit made in the bearer’s favor by Mr. Hall. The Rev. Dr. Hamilton explained to the boys the advantage of saving their dimes instead of spending them in cheap shows. The clergyman announced that no boy would be admitted to the next Christmas dinner unless he could produce a bank book, and that three prizes would be awarded to the three boys having the largest amounts on deposit. Mayor McBride was greeted with lusty cheers. Another feature of the Christmas here was the distribution at the home of Mrs. Emma Johnson on Hamburg avenue of one thousand gifts to poor children. The big guys thought this one up. We pulled it every Christmas. They’d have cards printed up, and they’d sell them to us little fellows for a nickel apiece. Let’s see if I remember just what was on those. Well, we paid a nickel apiece for those cards, and whenever we sold a paper we’d hand the card to the customer. Sometimes it was good for as much as a quarter. But this was the payoff. We always asked for the card back. They’d give us something, and they’d expect to keep the card, but we’d ask for it back; we’d use the same card over and over again—it would cost us a nickel to get another one. We called the big guys the “midnight cuckoos”—I don’t remember why. Superintendent Rudolph Heig of the Brace Memorial Newsboys’ Lodging House, at No. 14 New Chambers street, had charge of a dinner for two thousand newsboys yesterday. Several Cherry Hill girls, in boys’ attire, were found at the tables. They told Superintendent Heig they had been playing vagabond all day and, being hungry, went to the dinner as newsboys. They were allowed to continue at the feast. The food left when the newsboys were full was given to five hundred hungry men from Park Row lodging houses. Originally published in the New York Daily-Tribune on November 30, 1906. The rolling year brings round The Star Newsboys’ red letter day. It has been the annual custom for the Star to give a Thanksgiving feast to the little chaps who give such efficient help in distributing and selling the paper. The newsboy is a Star institution. He is of all nationalities, but is largely from the ranks of the Portuguese. That thrifty nationality is quick to earn a quarter when it sees a chance and its young lads follow in the footsteps of the heads of the families. But their example is followed close by energetic Hawaiian and part-Hawaiian lads. The newsboys made quite a little income to add to the family funds. In times of great demand, some of them rake in from two and a half to three dollars, and most of them average from 50c. to $1 a day. The money so earned is spent wisely. It assists in feeding and clothing the little fellows. Many of them save up to buy a suit which generally appears at the Thanksgiving dinner. The habit of earning and saving is thus early inculcated, and in many cases will last through life, laying the foundation for future success. The newsboys get a practical education which is of equal value to them as the literary education they obtain in the schools. And the newsboys are not ignorant, they know all about what is in the papers and keep up with the news of the world. They are moreover an institution of the city and make its streets look up to date. The boy may be noisy and he may be pushing, but he has in him the material that will make him a man and not a milksop. 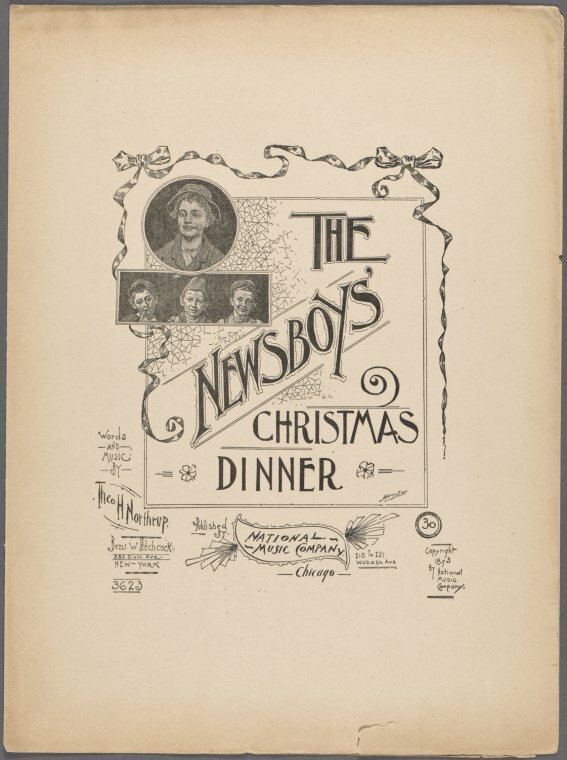 May The Star newsboys enjoy their Thanksgiving feast and holiday. Originally published in The Hawaiian Star on November 21, 1899. At the Newsboys’ Home last evening, Halloween was celebrated in a jolly manner. All the boys who attend the Sunday school, about 60 in number, gathered in the chapel at 8 o’clock. Superintendent Druitt and a few ladies and gentlemen who were present treated the lads to nuts, grapes, apples and sweet cake. There was an abundance for all, and the youngsters gorged themselves to repletion. Several jolly games were played. The greatest fun was found with the apples suspended by strings from the ceiling, which the boys tried to catch with their mouths. The Home was visited yesterday afternoon by Messrs. Roberts and Sawyer, members of the State Board of Charities. They had not been in the house for two years. They expressed surprise and gratification at the many improvements visible, and highly praised the work which Mr. Druitt has been doing.